This market leading blind is the first to be recognised by the Forest Stewardship Council and ensures the promotion of forest management that is economically viable, environmentally sustainable and socially responsible. Both Maxi and Mini blinds have strong aluminium head rails with easy to fit top/face fix brackets. 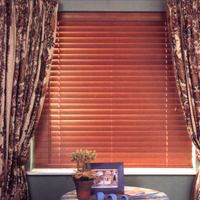 Hand selected timber slats ensure a quality finish second to none and these blinds can be trimmed in width by 75mm from each end whilst the drop of 160cm fits the majority of applications.